I realize Halloween is over and folks are already moving on to Thanksgiving. But remnants of candy surround me at work: Tootsie Rolls, Butterfingers, Nestle Crunch bars, even Sweethearts. Note to self: find a route that avoids the candy. So do you still have left over candy? Better yet, if you had a chance to have your pick what would you choose? On October 14, 1926 A.A. Milne's Winnie-the-Pooh was first published! One of my favorite books that even after 84 years is still entertaining. Fitting I discovered this tidbit as I’m washing the Eyore sweatshirt that got hungry at dinner. Oh Bother. Fortunately, I was able to change into my fleece featuring Piglet, Pooh, Eyore, Owl, Tigger and Rabbit. Most people go to Disney to see Mickey … I’m all about the Hundred Acre Wood Gang. Do you like old pooh, reinvented new pooh? Who is your favorite character? Opps. Sorry, wrong holiday, even if I have most of my shopping done. Excel spreadsheet in place (laugh, I'm not offended just organized), and since grandma is in town and says she “needs” a chore while we’re at work – my best elf wrapper. I admit, I need to start early, it’s the only away the holidays happen.. Especially, with shipping and spending it this year in FL with grandma. But, I’m kind of freaked out. Today, people at work are planning holiday parties – not to be confused with Halloween parties. Boyfriend just sent me a picture from his lunch trip to Home Depot. 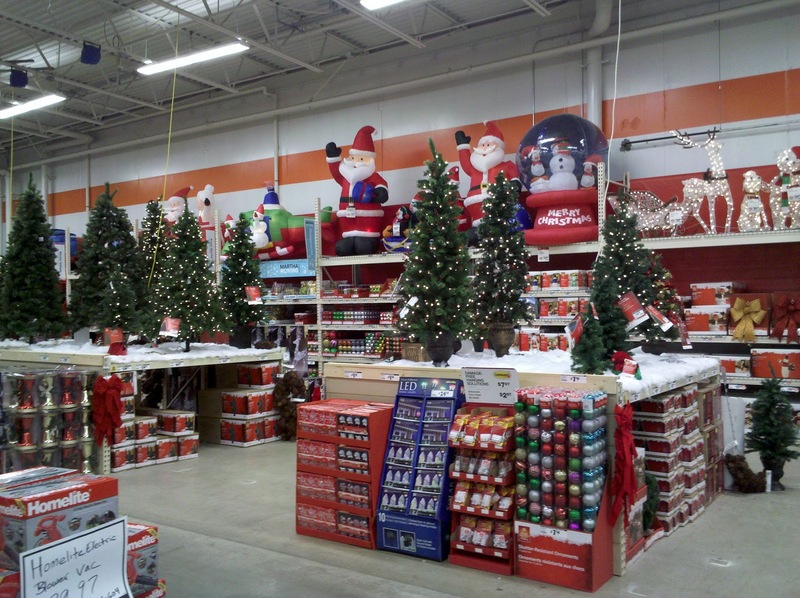 I’m not ready for decorations or music in the stores yet. Who would have thought Snoppy and the gang would be turning 60! The link has cute wallpaper, cartoons and while I haven’t figured out the game, it has a lot of fun stuff if you want to break into the Snoopy Dance. Roller coasters, bumper cars and twirl-a-whirls. Sunday boyfriend and I spent the day with friends at Hershey Park. Chilly, but a great weather to walk around, take in rides. Boyfriend won prizes playing skee-ball and tossing rings on top of bottles. Yay, more bears for me. I, on the other hand, felt like Charlie Brown and the football, my skee-ball game had so much promise and fizzled out midway through. It’s the one came I stick with as I’m not very good at the hoops, roll the bowling bar so it doesn’t hit the light and come all the way back or shooting. Chocolate screamed our names at the Chocolate World – Kisses, Mounds; Almond Joys …the list goes on. While we got our fill of the Hershey classics, we were disappointed to find that they didn’t have some of the unique things they used to have that you couldn’t find in the food store. In years past we’d go home with bags filled of unique treats. We did manage to find a new flavor of Good & Plenty – it was supposed to be hot but everything tasted like the fruit flavors mixed with cinnamon and was rather strange. The consensus was stick to the original. What is your favorite amusement park? Do you stick with rides, play games or both? Happy Birthday to one of my favorite cartoons! I realize my love stems from reruns. I could watch hours of Fred and Barney and their antics. I admit I haven’t seen the motion picture out of fear. Fear that yet again Hollywood butchered another one of my favorite Hanna Barbara cartoons. Seriously, I could watch Hanna Barbara Cartoons all day. Airports provide fodder: people watching, conversations with random people – I must have the sign on since usually they reveal things, most people wouldn’t tell friends. Not to mention time to write and edit without the usual interruptions or distractions. I’ve somewhat made peace (used very loosely) with Newark: use off-site parking and Terminal C is better than A (more food and shopping options). In the rare instance I can check a bag, plan on an extra hour for baggage if on Continental. Charlotte, Orlando and Tampa are my favorites for food and shopping and free Internet. Next week I need to go to Boston and will end up on Amtrak. While it will take longer than flying hopefully I will make good use of the time. Either way, it beats driving. What’s your preferred method of transportation? If you had to choose from the following, which would you like to come home to? I came home to boyfriend walking up to me and announcing we had nonpaying tenants. A brief panic set in. I refer to bats, mice and other grossness as nonpaying tenants. Fortunately, he wasn’t referring to bats which migrate and are expensive to remove ($14k at sorority house) so it’s like they’re charging you rent. Or mice. Seriously, I don’t think I could tell my parents I was moving home. Yes, I actually moved out of my meticulously clean apartment and paid rent until my lease ended since I refused to get a fury feline creature. And all my messy neighbors had one. Birds, not of Hitchcock’s variety, entered through the living room AC. Boyfriend removed (safely), cleaned up after and removed their portal. Thank no name birds for not destroying any of the furniture and for vacating the premises before my arrival. Please note your new location should be the bird feeder in the back yard. Maybe next time I’ll come to hear about the rabbits eating the garden or the bear that took a bite out of garbage can a few weeks ago. Seriously, I could get on board with the bear. Yes, I realize they can be dangerous creatures but they’re so cute. They wouldn’t have to pay rent. It could live in the yard. Note, if the other nonpaying tenants offered rent, the answer is still no – there are no vacancies. Loves good times with friends and hopes here is a place where writing and non-writing worlds collide.